A green spice of dazzling freshness with a vibrant lemon zest touch. 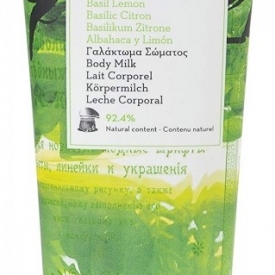 Moisturising body milk, enriched with Almond oil, active Aloe and provitamin B5 that enhance skin suppleness. Dermatologically tested. Suitable for vegetarians/vegans. A green spice of freshness with a vibrant lemon touch. Moisturising body milk with an exceptional powdery texture. Greek pharmacist George Korres founded KORRES based on his passion for capturing the best of nature using the latest scientific advancements. Inspired by the most powerful natural ingredients and traditions of Greece, KORRES delivers clinically proven results with formulations that reflect a meticulous attention to detail that is the heart of everything we do. A green spice of freshness with a vibrant lemon touch. The combination of Almond oil, active Aloe, provitamin B5 and Shea butter provides long-lasting hydration while enchancing skin suppleness. Almond oil, Aloe, provitamin B5 and Shea butter provide long-lasting hydration while enhancing skin suppleness. This is a nice product but not one I would rush back to buy again as my skin is very dry and soaks up body moisturisers and this just disappeared into my skin. * No Mineral Oil, Petrolatum / Parafin Wax, Silicones, Parabens, Propylene Glycol, Ethanolamines, SLES, ALES, Synthetic dye, Phthalates, Polycyclic Musks, Retinol, Animal by-products. A nice smelling natural body milk but not that moisturising and quite expensive. "This is a nice product but not one I would rush back to buy again as my skin is very dry and soaks up body..."